This time of year, students and families reach out to us with their gratitude. 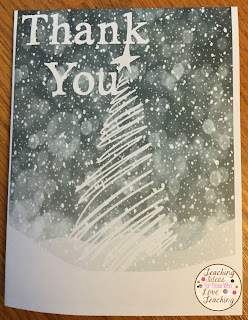 I love receiving my gifts, and always make it a point to write a thank you card to each student and their family. 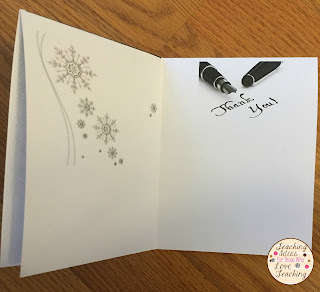 In years past, I would write my thank you cards over my holiday break. It began, however, to hang over my head during my break. In fact, there were several years where I found myself spending the Sunday night before going back to work writing thank you cards. 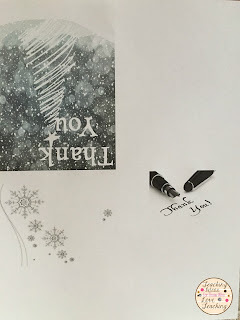 So, I began writing my thank you cards before going home for holiday break. I find an engaging activity for my students to do the last day of school (sometimes, it's a cute film) and I write out their thank you cards. I don't open the gifts in front of my students, I usually will jot down what the gift was on a sheet of paper during a break. Then, while my students are engaged I write out the notes. Typically, I set the completed cards aside and pass them out the first day back at work.